Transform Drupal log to a picture. This is a part of the whole picture. The IP addresses are fictional! At the end of August, I will be teaching a visualization workshop in Iceland. The workshop is part of the Nordic Security Conferene. The workshop has gotten quite a face lift. The visualization module was updated a lot to include more on graphs and visuals, as well as a little bit more on visualization theory that is immediately applicable to your every day security visualizations. I am introducing many more visualization tools in a hands-on fashion and I am, for the first time, going to teach a module on big data: Hadoop, Riak, Mongo, Flume, etc. What do they have to do with security intelligence and security monitoring? Come and explore the topic with me! I recently posted some new video’s to Tenable’s Youtube channel about how to visualize network attack and exploit paths in 3D. The videos are located on this playlist. They make use of data from Tenable’s Nessus and the Passive Vulnerability Scanner products to identify exploitable internet facing systems, exploitable internet browsing clients and exploitable clients that are trusted by servers. There is also a blog post and white paper on this sort of 3D analysis on the Tenable blog. VizSec 2012 will be held in mid-October as part of VisWeek in Seattle. When we know the exact date, we will update the web site. Papers are due July 1. Digging into my various BGP datasets, I decided to create a GraphViz dot files with all the unique AS path in BGP for Internet as of Today. The dot file is available at the following location: http://www.foo.be/internet-dot/BGP-ASN-Paths-20120403.dot (! 44MB) and a quick overview of the dataset with Gephi: http://www.foo.be/internet-dot/Top-ASN-20120403.png. You can directly see the ASN 3356 (Level 3), one of the most connected providers. I used the "Radial Axis" layout that is well suited for such kind of dataset. The internet view (from this BGP router) contains 40898 ASN representing a majority of the ISP on the Internet. The dataset can be used to experiment Gephi or other tools to handle large graphs with a lot of connections. The dataset will be updated at a regular interval. If you have any ideas, feedback... let me know. I wrote a small blog post about AfterGlow and how to visualize packet captures. It gives a few examples on how packet captures can be visualized as link graphs. I then followed up with a post on Advanced Network Graph Visualization with AfterGlow. In this post I show how you can use some extended capabilities of AfterGlow to read configuration parameters from variables and files in order to influence your network graph's colors, clustering, etc. The picture shows attacks from the Internet to computers located at the University of Konstanz (brute force SSH attacks). The background represents the university’s network structure with computer systems as rectangles. External hosts are shown as colored circles on the outside. 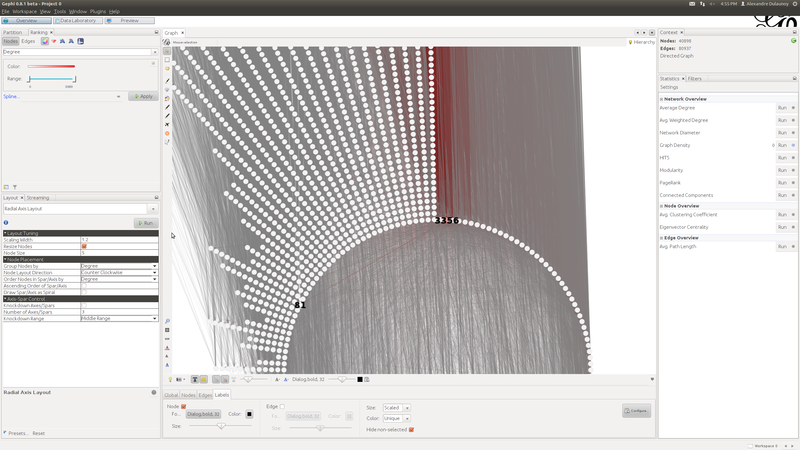 The splines represent the connections between attackers and computers within the network. This reveals a distributed attack originating from hundreds of hosts working together in attempt to break into specific computer systems. Computer networks are dynamic, growing, and continually evolving. As complexity grows, it becomes harder to effectively communicate to human decision-makers the results of methods and metrics for monitoring networks, classifying traffic, and identifying malicious or abnormal events. Network administrators and security analysts require tools that help them understand, reason about, and make decisions about the information their analytic systems produce. To this end, information visualization and visual analytics hold great promise for making the information accessible, usable, and actionable by taking advantage of the human perceptual abilities. Information visualization techniques help network administrators and security analysts to quickly recognize patterns and anomalies; visually integrate heterogeneous data sources; and provide context for critical events. Articles should be written in a style comprehensible and appealing to readers outside the speciality of the article. Authors must follow the IEEE Network Magazine guidelines regarding the manuscript and its format. For details, please refer to the "Guidelines for manuscripts" at the IEEE Network Magazine web site at http://dl.comsoc.org/livepubs/ni/info/authors.html. Submitted papers must be original work and must not be under consideration for publication in other venues. Authors should submit their manuscripts in PDF through ScholarOne for IEEE Network Magazine. Choose this special issue from the drop down menu on the submission page. Authors uncertain about the relevance of their paper to this special issue should inquire with the guest editors before submission.